With the glass rod comminute a spatula-tipful sodium carbonate with a spatula-tipful salicylic acid in the crucible. With the tongs sway the crucible over the burner flame until a pungent phenol smell develops (Attention! Carefully fan the vapors arising out of the crucible towards oneself). 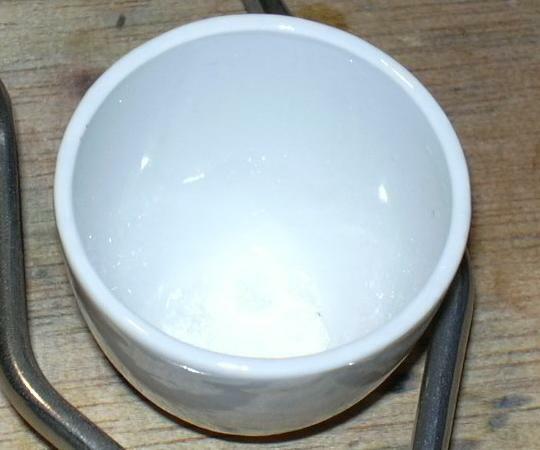 Usually fine needles of phenol or sublimated salicylic acid are deposited on the cooler parts of the crucible. Solid organic waste. If the reaction is cancelled immediately after the begin of the formation of phenol, the residue can be discharged into the drainage. Through strong heating carbon dioxide can be split off from salicylic acid or many aromatic carboxylic acids (a classical case is, for example, the demonstration of benzene from benzoic acid and lime. On the sides of the crucible fine crystals are deposited.